This is a favorite of mine and it’s something that I have been making for years and years….I think the first time I brought it to a party I was actually in High School……sooooo it’s OLD! But it’s something that never disappoints..well except this one time when I brought it to a party and some drunk friends decided to put it in the oven and cook it……..people still ate it, but it wasn’t very tasty. PLEASE…DO NOT HEAT THIS DIP….TRUST ME! The nice thing about this dip is that you can make it however you want…..and add or subtract ingredients….or add extra or less of others…..Just make it to your liking. There really aren’t measurements to it! This is perfect for any time of year……and a great dip for football games! 1. Spread refried beans over a large circle serving platter. I try to use one with a small lip. 2. Spread guacamole on top of beans. 3. Mix sour cream and taco seasoning in bowl and then spread over guacamole. 4. Layer chopped tomatoes on top of the sour cream mixture. 5. Spread sliced olives all around. 6. Sprinkle cheese on top of the tomatoes and olives. 7. 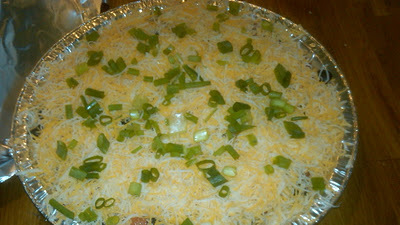 Sprinkle chopped scallions over the entire dip. I love the 7 layers that are in it. Your the best cooking mom ever!!!! What a compliment! “Best Cooking Mom Ever!” I’ll take it!